The Turnbulls are a powerful Scottish clan from Rulewater with a proud history. Gavin Turnbull was married to Mary Isabella Myers (1827-1869) in Madras, in December 1856. Mary’s mother was Mary Anna Duncan (1798-1874) from a long line of Naval Officers in Scotland, of whom more another time. Gavin was a doctor, in the Army in India, (as opposed to the Indian Army of Charles M. FitzGerald). In those days, before the formation of the Royal Army Medical Corps, he carried the commissioned rank of Surgeon. He was gazetted as Assistant Surgeon on August 15th 1850, at the age of 22. One must wonder how the training he had received by this tender age fully qualified him for his later responsibilities. A letter from a very ancient Colonel W. Campbell to FA Simonds (1881-1953) in 1930 says “I knew your grandfather Turnbull quite well …… he was throughout the Crimean War with the Inniskillings, and was probably in the charge of Scarlet’s Heavy Brigade at Balaclava”. 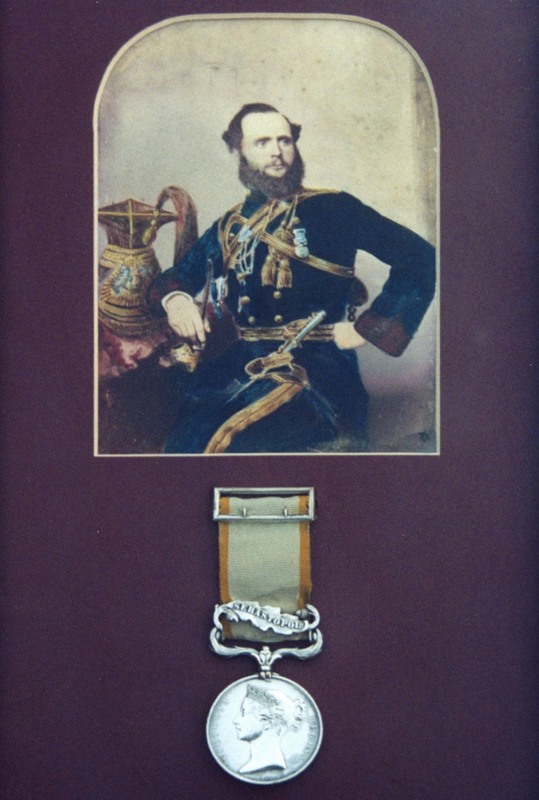 However, Campbell’ s memory may have been at fault, since Hart’s Army List 1872 records that Surgeon G. A. Turnbull served with the 12th Lancers in the Crimean campaign from May 12th 1855, including the siege and fall of Sebastopol, for which he was awarded the campaign medal with clasp and Turkish medal. It is interesting to speculate that as a military doctor he may well have encountered at this time Florence Nightingale, who was herself an antecedent of Catherine Hare (née Verney). His regiment must soon after have been posted to India, and subsequently been ordered home since a further letter from Col. Campbell records that; “he exchanged from the 12th Lancers to the 6th Inniskillings to remain in India where he liked the sport and the pay”. I rather care for this comment, a liking for sport and pay is a characteristic which seems to have penetrated into the fourth and fifth generations! While in the 6th Inniskilling Dragoon Guards at Ahmednugger in 1861, apart from christening his 2nd daughter Edith Ella Turnbull, he became rather unhappily involved in a court-martial which developed into a cause-célèbre, ultimately reverberating around Whitehall and bringing down the wrath of the Duke of Cambridge, Commander-in-Chief of the Army, on all who were concerned in it. The whole story is narrated in a book entitled “Last Post at Mhow” by Arthur Hawkey, pub. Jarrolds 1969. The professional evidence of Surgeon-Major Turnbull before the court was a key factor in the case against his brother officer, Captain Smales, accused of extreme cruelty to his subordinates. This evidence seems to have been somewhat inconsistent. Capt. Smales was cashiered and a cloud fell on the military career of all who had been associated with him. According to Campbell, Turnbull was ‘advised’ to exchange to the 21st Regiment of Hussars, still in India. His career ended as Staff Surgeon Major in Edinburgh in 1873-74 where Campbell as a young man became acquainted with him. He died at Clevedon, Somerset in March 1876 still aged under 50.